FME Architecture + Design has designed a new office for construction and engineering firm Stacy and Witbeck located Alameda, California. 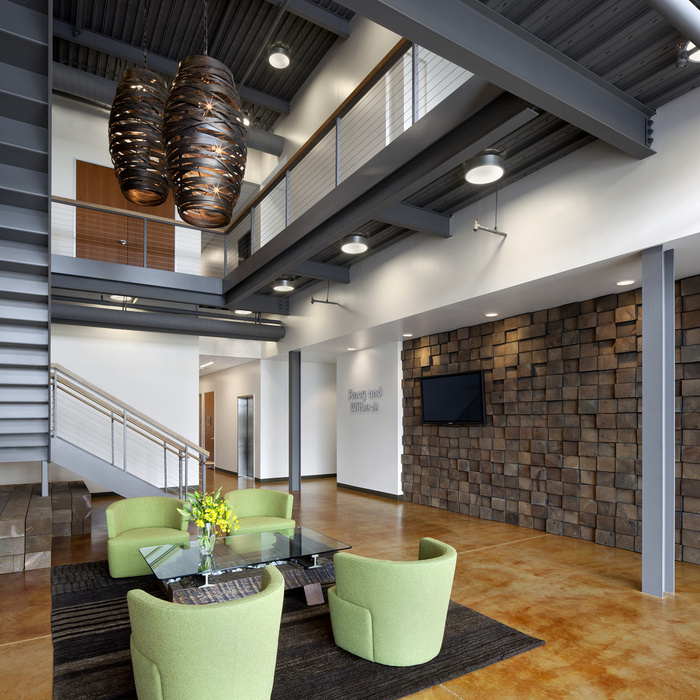 This 20,000 square foot office building is the new headquarters for Stacy and Witbeck, a national leader in public transportation construction and engineering. It sits along a strip of land in Alameda, known as the Esplanade, facing the San Francisco Bay. The project encompassed both ground-up and interior design portions allowing the team to fully utilize the dramatic water views. The warm brick façade is complemented by dark bronze window frames and louvered sunscreens, with wood panels leading into the double-height lobby. The building layout leverages the center of the space to connect the two floors with a dramatic atrium and signature stair. The interior design features exposed columns, polished concrete floors, fired brick construction blocks, and custom fabricated furniture made from untreated railroad ties to evoke the client’s industry. This building is LEED Platinum Certified.